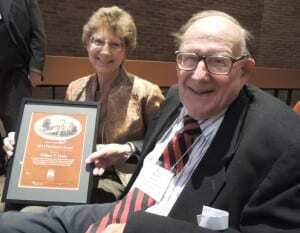 Vermont Historical Society President Laura Warren presents Senator William T. Doyle with the President’s Award for his heroic deeds preserving Vermont history. Senator Bill Doyle was presented the President’s Award at the Vermont Historical Society’s annual meeting on Saturday, September 21, 2013. In recognition of his lifelong preservation of Vermont’s history through community documentaries, professorship at Johnson State College, History Day judging, active engagement with the VHS and other heritage organizations, and many other heroic history efforts, the Vermont Historical Society also set up a William T. Doyle History Day fund. Mark Hudson, executive director for the Historical Society, noted, “The VHS has created the William T. Doyle Vermont History Day Fund to support activities associated with this essential educational event.” Vermont History Day is an exciting education program that encourages students to explore a historical topic and present their research at a statewide competition. Each year, students discover and analyze historical sources, presenting their findings in the form of a documentary, exhibit, paper, performance or website at a statewide competition held in early spring. Some projects then qualify for National History Day in late spring in College Park, Maryland. History Day is open to students in grades 5 through 12 and home study students ages 10 to 18. Students who participate in History Day develop important academic skills, as well as 21st-century career skills, including teamwork, time management and public speaking. Contributions to the William T. Doyle Vermont History Day Fund will help support this program for Vermont students. Please contact Jane Campbell at (802) 479-8516 for more information. In addition to Senator Doyle’s accomplishments listed above, he is also the author of The Vermont Political Tradition, which has been adopted for use at several schools and colleges including the University of Vermont, as well as author of the annual Town Meeting Survey.